How a lovable English curmudgeon found lasting happiness in life’s little pleasures. "Here is a stew that has been seasoned with many onions, red wine and honey - and my delight." THE ENGLISH novelist, journalist, essayist and playwright J. B. Priestley (1894-1984) was no Pollyanna. As he readily admits in his preface to this delight-filled book, he was known to grumble, sometimes loudly. Which on first blush seems surprising, given Priestley’s career trajectory. This Yorkshire lad became a Cambridge man (Trinity College) and one of the most productive writers of the age: he published no less than one hundred twenty books. Besides being prolific he was successful. And he was able to pursue his craft for all of his adult life. Twenty-one of his books were written between the ages of 70 and 84. But Priestley knew that there was more to this thing called happiness than an assemblage of accomplishments. We'd love to hear about the small thing that gives you great pleasure. I'll start the conversation by sharing one of my Delights: the watery wind chime of halyards on masts of sailboats at anchor, a sound I associate with some of my favorite days. How about you? Please email us at cservice@levenger.com. We'd love to hear from you. For all the fulfillment that a career or a calling can offer, just what is it that really makes us happy? Studies on the subject of happiness abound. But we think Priestley had it right. Happiness is predicated not so much on a single event as it is on the continuous accrual of small delights. Gather enough kindling and you can get a cozy fire going, enough flowers and you'll have a bouquet, enough friends together and you'll have a memorable day. And so it is with happiness: find the extraordinary in the ordinary, the grand in the quotidian. And for this there is no guide quite like J. B. 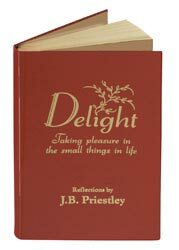 "Items of felicity" is how Priestley describes these delights: those fleeting moments and quirky pleasures that sustain us through a lifetime of routine, responsibilities, setbacks and successes. For J. B. they ranged from drinking mineral water in foreign hotel rooms, to the day he discovered Vermeer, to the first glimmer of an idea on the mind's horizon and the "ravishing delight" it brings. Some, such as the pleasure he takes in the stereoscope, belong to a time now past, but to each era its singular satisfactions. Even in J. B. 's day, though, escaping from "our new servitude to Time" was a joy. Plus ça change. Delight is a highly personal collection of things to be happy about, yet how easy it is to identify with the pleasure they bring. We have all experienced similar frissons and inner smiles. It is the privilege of the curious and the engaged - and wouldn't you like to add to your repertoire? However happy you are, prepare to be happier still after sampling the well-seasoned stew that Priestley has cooked up on these pages. It is a delight indeed. © 2007 Levenger. Excerpted from the Levenger Press edition of Delight by J.B. Priestley.